In this episode of The Woof Meow Show from Saturday, October 13th, Don travels to Camden where he interviews Brandi Moore and Claire Brunner of the P.A.W.S. Animal Adoption Center where Claire is the Director of Animal Sheltering and Brandi is the Director of Programs and P.A.W.S. resident Dog Trainer. Don, Claire, and Brandi discuss the history of P.A.W.S., their mission, vision and core values. We also talk about how PAWS is governed and financed and then get into the details of the dogs and cats P.A.W.S. cares for and rehomes. Claire informs us how potential adopters can learn about the pets currently at P.A.W.S. and then explains how you can apply to adopt one of these marvelous furry companions. 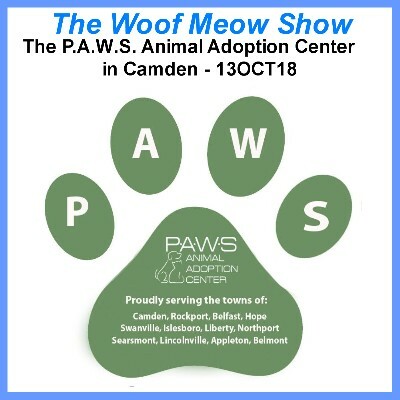 Even if you do not reside in the immediate Camden area, the P.A.W.S. Animal Adoption Center is a shelter you will want to visit, either online or better yet in person, if you are looking for a kitten, puppy, dog or cat. Brandi concludes our show by telling us about several upcoming events at P.A.W.S. including their annual auction on Thursday, November 29th and a presentation Don will be doing on Saturday, November 10th entitled Understanding Dog Behavior, How Dogs Learn, and the Best Ways to Train Them. The show concludes with a discussion of how you can help the P.A.W.S. Animal Adoption Center in Camden and how you can find both their facility and website and Facebook page. Don asks that you please “Like” them. 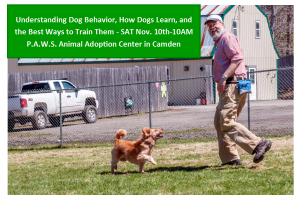 Please join Don when he presents the latest science on dog behavior, how dogs learn, and the most effective and humane ways to train our furry friends. In 2015, the American Animal Hospital Association (AAHA) reported “Mistaken or misinformed beliefs…” about canine behavior and training are a significant reason people experience behavior problems with their dog, along with the continued use of punitive training techniques. What is the most humane and effective way to train a dog? 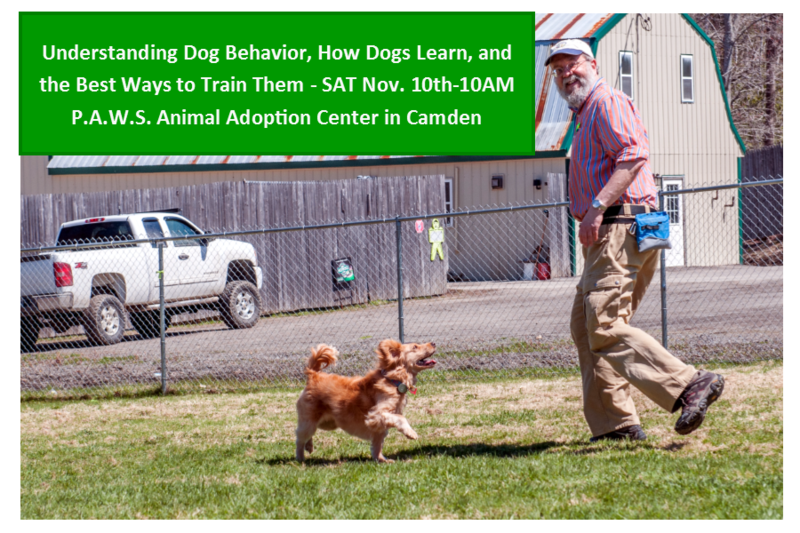 Understanding Dog Behavior, How Dogs Learn, and the Best Ways to Train Them is free and open to the public. Light refreshments will be available. This event is brought to you by the PAWS Outreach Committee as part of the Second Saturday Humane Education series. Next Next post: Shared Blog Post – Does a Wagging Tail Mean a Happy Dog?